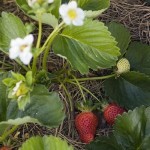 It’s a great time to plant strawberries as they’ll get established quickly as the days lengthen and the soil warms up. If you’re buying plants, buy the biggest you can afford and check how well the roots have developed. Some have scrawny roots even in big pots but you don’t want them ‘root bound’, just nicely filling the pot. I planted mine slightly closer together than usual (4 x 4 in a metre square). I ‘double dug’ the bed first and then incorporated some ‘rapid lime‘, Earth Zing and ROK solid planted the plants and watered with liquid fish fertiliser. You’ll find more information in my strawberries and sunshine article. I’m now using the frame of an old greenhouse, missing all but a single pane of glass, as a berry cage. I’m a convert to these cloche hoops. They’re stocked by Otaki Hydroponics. The hoops are light and strong and hold the mesh, plastic or frost cloth while still allowing easy access so would be perfect for strawberries once they’ve come off your seedlings. I’ll mulch them in a few weeks and keep up the weekly feed with liquid fish.